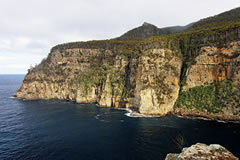 The stunning coastline of this region includes some of the highest sea cliffs in Australia. Waterfall Bay offers a spectacular view across the cliff lined bay to a waterfall which, after rain, plummets straight into the sea. Click on each text link for more details. Waterfall Bay bushwalk is close to the location of Eaglehawk Neck, a small town that sits on the very narrow isthmus that separates Tasman and Forestier peninsulas. In convict times it was blockaded by police, soldiers and a line of chained savage dogs to prevent escape from the Port Arthur penal settlement. It is now known as a fishing spot, with a tuna-fishing fleet operating from Pirates Bay. Camping is available nearby at Lime Bay.